Think about removing hazards to lower the liability risk of your short term rental. Accidents happen, but they don't always have to happen. When we live in our homes we become familiar with its peculiarities. However, guests are experiencing the property for the first time so the possibility of an accident occurring is much higher. I know where the crack is in the sidewalk. I also know which step is a little loose on the stairs, but my guests do not. One of the reasons many insurance companies refuse to insure homes that are used for short term rentals is the higher propensity for accidents. When a member of my family is injured on my property the insurance company simply pays the medical bill. However, when a guest becomes injured the insurance company may end up paying much more in liability costs. It is imperative that you look for potential liability issues as you prepare your property for guests. Here are some ideas to look for to limit liability. It is a good idea to have a friend pretend to be a guest and walk around your property both inside and out to look for hazards. Someone who is not as familiar with the property may very well see something that you missed. Walk out to the end of your driveway and look around. Limiting liability begins at the edge of your property. If you have ditches on either side of the drive you can place reflective markers on the drive's edge to make sure a guest's car does not go off the edge. Many of our guests have walked to the end of our drive and looked around. Yours will probably do the same so make sure there are no trip hazards like rocks, cracks or uneven concrete or pavement. 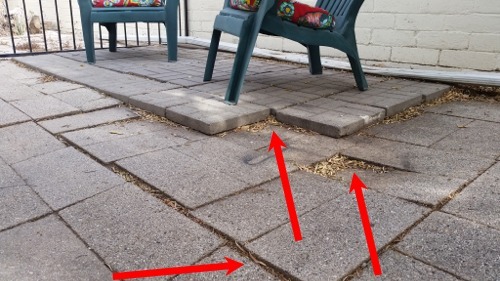 Next, look at every sidewalk and walkway around your home for the same trip hazards mentioned above. Walk around the home paying attention to any holes or dips in the yard that a guest could twist their ankle in. Do you have any low border walls that could become a trip hazard after dark? Speaking of darkness, are all of your walkways well-light so that guests will be able to navigate easily in the dark? Take a worst case scenario approach: assume your guest is intoxicated and lost while attempting to reach their entry door. In some cases, small steps can easily be removed by turning the step into a ramp. In one of our homes we completely removed a sidewalk between the main house and an out building so that guests would not have to step up. We then lined the guest's walkway with white Christmas lights to add both a decorative and safety touch. We also had about a four inch step up to the concrete floor of our patio area. To mitigate this trip hazard we brought in dirt and sloped the lawn up to the edge of the patio. It's time to move inside after you have ensured the outside of your home is safe. Basic safety measures should be taken. A good rule of thumb is to "baby-proof" the home even if no children or infants will be allowed as guests. The following is a non-comprehensive list of safety recommendations. 1. Verify that smoke detectors are in every room with fresh batteries installed. Replace the batteries every six months. 2. Place carbon monoxide detectors in every bedroom and in each common area if your home uses natural gas or propane for heat. Place detectors near but not next to specific items using gas such as water heaters or kitchen stoves. Combination smoke/CO2 detectors are not the best idea as CO2 gas is heavier and concentrates toward the floor, not the ceiling. 3. At least one fire extinguisher of a minimum 10ABC rating in the kitchen should be mounted in an easy to see location. 4. Measure the water temperature of the tap closest to the water heater to make sure it does not go above 120 degrees Fahrenheit (49 degrees Celsius). 5. Area rugs should not have any raised edges that could result in a trip and fall. 6. The tub or shower floor should not become slippery when wet. Have tub mats handy. 7. The floor outside the shower/tub should have a matt to prevent the floor from becoming wet and slippery as people exit their bath/shower. 8. Stairwells should have automatic dusk to dawn lighting so that the stairs are never in darkness. 9. Heavy objects such as TVs should be mounted to the wall to prevent their being knocked over onto someone. 10. Dressers should be secured to the wall to keep them from tipping over if the drawers are pulled out. 11. Cleaning chemicals should be locked in a cabinet or closet. 12. Candles and burning incense should be completely removed from guest areas to prevent fires. 13. Electrical outlets should not be overextended with more than two items per outlet. 14. Use cool bulbs (LED) in bedside lamps in case a lamp gets knocked over. 15. Place fire escape ladders in any bedroom higher than the first floor. 16. Make sure bars over windows in the bedrooms have properly operating emergency release mechanisms. NEVER allow a guest to stay in a bedroom with burglar bars that do not have working release mechanisms. Some areas require short term rentals to have basic safety information such as fire escape routes and emergency phone numbers posted. Whether it's required or not, I think it's a good idea. Draw fire escape maps and post them in each room. An emergency number list should include the home's address as well as the local emergency number and poison control hotline. We placed solar lighting outside our home so that the exterior where guests might be remains lit at all times regardless if the guests turn off the outside light switch. Advantages of solar lighting are lower utility bills and there is no need to run new electrical wires to the lights. Although it may help you in a lawsuit to be able to show that you took a lot of time and attention toward taking all steps needed and necessary to mitigate any liabilities on your property the ultimate goal is to drastically reduce the possibility of an accident in the first place. Don't shortchange yourself in this step of preparing your property for guests. This is a picture of a walkway at a short term rental I visited recently. 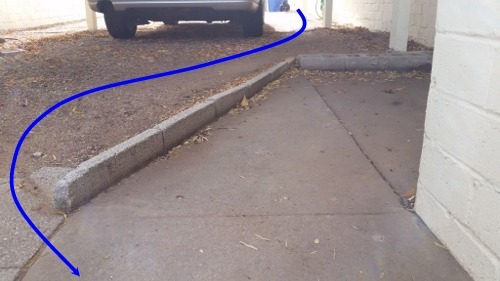 The guest would need to follow the path I've outlined in blue in order to get from their car to the guest door. Simply removing the concrete blocks would negate this obvious trip hazard and liability while at the same time make it easier for guests to walk in a straight line to the door with their luggage.